It’s never too late for a second chance at love in this uplifting and warm-hearted romance. When Juliet Scott falls for ruggedly handsome Pete while away travelling, she never imagines how different her life will be to that of her sister, successful and beautiful model Hero. Based on a cattle station in the vast Australian Outback, Juliet’s life is now simple, down-to earth and honest, and the perfect antidote to the chaotic celebrity lifestyle that Hero leads in the UK. With her striking brunette hair, perfect posture, and mesmerising green eyes, it is no wonder Hero has come so far in such a superficial industry. But when tragedy strikes, Hero finds herself in the arms of her sister, recuperating from a terrible accident on the other side of the world. With her modelling career in tatters, and her scars more than just skin deep, Juliet worries that Hero will hide behind the mask she wears forever. But does Australia have something, or someone, to offer that London never could? No One Cancels Christmas: The most hilarious and romantic Christmas romcom of the year! Around the World with My Ex: Travel round the world with the latest book from bestselling author Maxine Morrey! She practically took out my eye with that cleavage. She’s most definitely more woman than I’ll ever be. Shame you didn’t back over the pneumatic bimbo whilst you were at it. Angst is not my friend, I crave balance in my world – crazy I know – it is just my personal preference. While well written with an interesting premise, this book was so angsty it was painful. Yet I was hooked and just couldn’t seem to let it go despite my pique, I was intrigued by the story and had to know what happened, regardless of having to wade through a tale that was 90% conflict and tension to get to that coveted HEA. Ms. Morrey certainly made me work for it, but it was worth it. The quick glimpses of humor and romance were brief respites, refreshing and well appreciated. The characters were an interesting and endearing mix of Brits and Aussies. I frequently lost patience with the main character of Hero, who was the vortex of all the angst. Hero was an international supermodel who had a kind heart, yet she was an ice queen, deeply damaged, self-involved, terminally stubborn, and extremely anxious and uptight with a penchant for running away and shutting down when uncomfortable issues arose; a childish and tedious trait. Hero’s sister married an Aussie with a sheep ranch in the Outback, hence the dual-continent tale. Of course, I enjoyed the Aussie side of the story considerably more, due to the handsome men residing there as well as the sizzle and dust they kicked up. This time my new vocabulary lesson includes a mix of Brit and Aussie words, with Brumby – the wild horses of Australia; Pommie – a derogatory term for a Brit in Aussie speak; and Antipodean accent – what Brits call Aussie and New Zealand accents. 4.0 out of 5 starsDrama in the Outback! A sweet Romance about life’s second chances and reinventing yourself! An engaging love story set in rural Australia... A book full of heart, hope, family, and lots and lots of angst... I can be a bit of a drama queen myself so I do love some good old fashion drama in my books! Juliet and Hero are sisters and have always been close... however, Juliet is now living in Australia after falling in love with Pete... meanwhile hero is busy being a famous supermodel in the UK.... when tragedy strikes Hero finds herself heading to stay with her sister in Australia to heal her scars, inside and out... never did she ever think she would be drawn to such an isolated area or fall in love... but can Hero’s frozen heart be thawed? A wonderfully told romance filled with engaging characters and a beautiful setting! Recommend! 🎵 Music running through my mind, this song was running through my mind for obvious reasons! Hero is a great name, but I think if that was my name I’d feel a lot of responsibility to live up to its meaning! Emotional, engaging, and heartwarming, SECOND CHANCE AT THE RANCH by Maxine Morrey is a wonderful contemporary story of love finding you when you need it most. Juliet and Hero are more than just sisters, they are the only family that they have so when Juliet finds the love of her life in the Australian Outback, Hero is delighted for her caring and compassionate sister but she understands that their relationship will change. But it's fine because Hero can throw herself even more into her successful modelling career where she wears a mask of cool control and detachment. However underneath it all, Hero is still that little girl that yearned for her parent's love which they were unwilling to give. As Hero gets to know Juliet's new extended family she cannot help but fall under their spell a little, especially around Nick, but Hero knows that opening up leads to heartbreak so she runs away. But when tragedy strikes, Hero's life will turn upside down and inside out but maybe she will find the path she was destined to follow and open herself up to love. I really enjoyed this book and while at times Hero annoyed me because she was so determined to remain alone, as we learn about her childhood I could understand her reasons. The setting is tranquil and inviting, and the home and lifestyle of Juliet and Pete were really appealing. 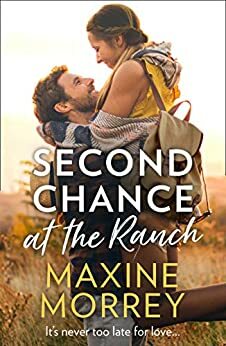 There is drama, secrets, sadness, and hope and I thoroughly recommend SECOND CHANCE AT THE RANCH by Maxine Morrey to all contemporary fiction fans.